Note: This is an expanded version of a capsule review that originally appeared in August 2011. Have you ever had one of those times when you couldn’t decide between a comedy, absurdist family drama, horror, or a musical? Thanks to extraordinarily prolific, genre-crossing director Takashi Miike, now you don’t have to choose. The Happiness of the Katakuris Miike deftly blends all of these elements like ingredients in an elaborate recipe, to create a potent, profoundly entertaining stew. Based on the excellent dark Korean comedy The Quiet Family,* The Happiness of the Katakuris uses that film as a departure point, before veering off into unexpected directions. 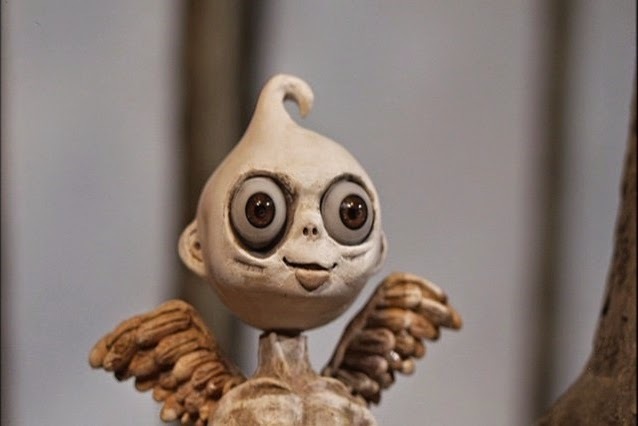 From the opening scene, with its trippy stop-motion animated sequence, you can tell anything can and probably will happen. * In the DVD commentary, Miike recalled meeting the original film’s writer/director, Kim Jee-woon, in Korea. When asked how he liked Miike’s version, he responded that he didn’t hate it. Former shoe salesman Masao Katakuri (Kenji Sawada) envisions a better life for his family, and opens a charming little inn in the country. The trouble is, business isn’t exactly booming. 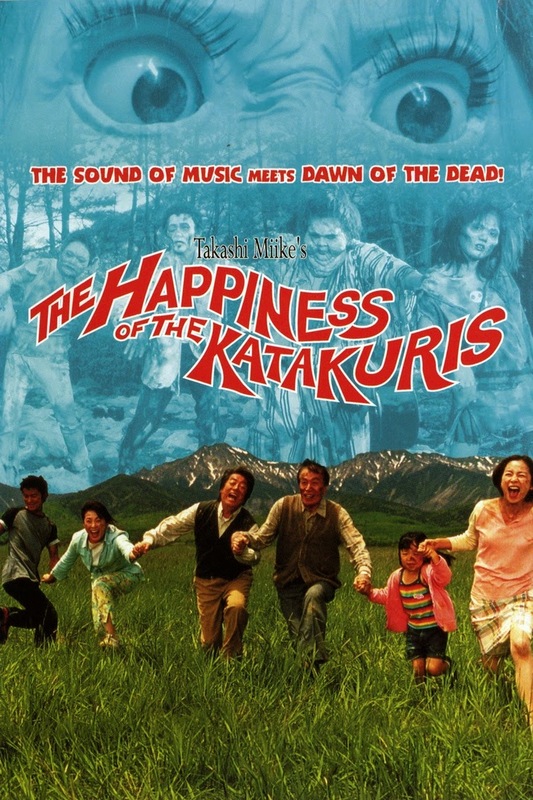 The Katakuris finally get their first customer, a depressed middle-aged man (played by film critic Tokitoshi Shiota), who subsequently kills himself. Instead of calling the police, and potentially letting bad publicity leak out, they decide to bury the body on the premises. Things go from bad to worse when a Sumo wrestler and his petite girlfriend stay the night, and due to (ahem) compatibility issues, meet an untimely end. For the Katakuris, every silver lining has a cloud, with impending doom lurking just around the corner. To reinforce the metaphor of their ominous predicament, a volcano looms ominously above the bucolic landscape, threatening to blow its top at any moment. The rest of the Katakuris endure the ups and downs, with varying degrees of success. Veteran actor Tetsurô Tanba plays patriarch Ojîsan Jinpei Katakuri, who has little tolerance for fools (and crows, apparently), and does everything within his power to protect the family’s honor. Terue (Keiko Matsuzaka) just rolls with the punches as Masao’s ever-supportive wife (her daughter comments that she could feed Masao poison, and he’d willingly eat it). Shizue (Naomi Nishida) is Masao and Terue’s unlucky in love daughter. She falls for con man “Richard” Sagawa (Kiyoshirô Imawano), who contends he’s an officer in the British Royal Navy and the son of a Japanese father and Queen Elizabeth’s half-sister. Shinji Takeda rounds out the cast as Shizue’s brother, and Katakuri black sheep, Masayuki. Recently released from jail, he strives to win the family’s trust, while pretending not to care what they think. Amidst all of this insanity, there’s an underlying purpose to The Happiness of the Katakuris. At its core, it’s an uplifting story about family cohesiveness, resilience and the value of life. Like the disparate elements of the film, it seems impossible that the Katakuris could ever work together as a family unit, yet somehow they do. It’s a testament to their strength that they stay together. No matter what life throws at them, they thrive in the face of adversity. Along with the familial bond themes, Kikumi Yamagishi’s script weaves together an overarching message about the inseparable relationship between life and death. This relationship is best summed up in a line spoken by Jinpei: “How you die is down to how you live.” Death is an inevitable part of life, not to be feared but accepted. Because life is finite, it should be savored, not squandered. The Happiness of the Katakuris achieves the nearly impossible by improving on the original film, and adding depth to the basic story. Takashi Miike, equally comfortable with multiple genres, ranging from horror, to yakuza drama, to samurai action and supernatural fantasy, applies his “anything goes” aesthetic to great effect. He employs every trick in the book to keep things visually and aurally engaging, incorporating wacky animation, catchy songs, gallows humor and colorful characters, all capped by a surprisingly touching finale. Miike is a master chef who revels in crafting a perfect recipe, cobbled together from the most unlikely ingredients. The Happiness of the Katakuris is among the director’s best efforts, and easily one of his most enjoyable films. If this movie doesn’t leave you smiling at the end, there’s something wrong with you. It sounds wonderfully odd and entertaining! I guess you can tell I'm a big fan of this movie. It's well worth checking out! If you get a chance, check out The Quiet Family too. What are the odds? You covered one of a very small handful of Japanese movies I've seen. In fact, I watched this after seeing Audition. I was impressed that Miike could switch gears so completely and still come up with a winner. I have a soft spot for movies to which I can think of no clear antecedent. Good, bad, or indifferent - I like seeing something I haven't seen before. It had to happen sooner or later, right? Yeah, it's hard to believe the same director that did Audition also did this film. If you're up for more Miike madness (and contrasts), I recommend checking out Zebraman and Ichi the Killer.